This is not something I’ve done before. Consider it the “special features” section on a DVD. I wanted to record some of my thoughts (and/or the shared thoughts between Amy and I) and learning experiences while working on the books. These posts include things we learned that are not shared in the books, as well as the thoughts behind the content we did share. The city is busy, fast, modern, and perhaps a bit more worldly than the capital in Beijing. This mirrors the differences between New York City and Washington, D. C. here. One travel article I encountered said that taking the high-speed maglev train from the airport into the city was a perfect introduction to Shanghai because of the high speed. The words “fast” and “fashion” were the first used to describe the city when I interviewed our contributor. The skyline of the Pudong area of Shanghai as seen from the Bund. She said that Shanghai men are immaculately dressed. Not in terms of social events, but for business. Tailored suits, precisely-manipulated hair, expensive imported shoes, a Shanghainese businessman spares no expense in terms of appearance. Well, there is likely a lot of competition in the world’s most populous city, so I can understand looking for an edge. Li, our contributor, did not talk about the fashion habits of Shanghai businesswomen. There is a sense in the city that it is elite. It has long been a trading center. When Deng Xiaopeng instituted economic reforms in China (1978), many coastal cities were given some economic leeway. He left out Shanghai. This was in spite of the city’s status as a driver of the economy. In this, perhaps the city’s elitism worked against it. I recently read Life and Death in Shanghai by Nien Cheng and it gives the impression that the city was never quite tamed, at least in the eyes of the Chinese Communist Party. No matter, the reforms extended to Shanghai in 1992. Since then, the famous new skyline of the Pudong area of the city arose. More than a little of it was the result of investment from firms in Hong Kong and overseas. As the buildings grew, so did the population. Another important piece of the “elite” self-image is language. 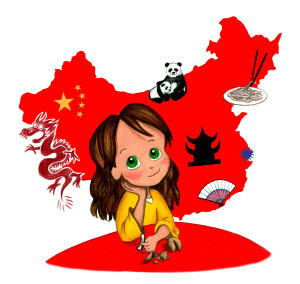 In China there are, in the main, two languages: Mandarin and Cantonese. There are also a number of other forms of the language and they share aspects of one of these. Wu Chinese shares the same characters (spelling) as Mandarin, but the pronunciation is different. Shanghai has its own dialect of Wu that is called Shanghainese. I have contradictory information about Shanghainese. The thoughts shared, at the same time, is that a Mandarin speaker cannot understand a Shanghainese speaker, but they speak the same language. This is true, from what I’ve learned, with many phrases. The differences are in pronunciation. However, Shanghainese is more expressive than Mandarin. That is, it has a larger vocabulary so the language is more descriptive. 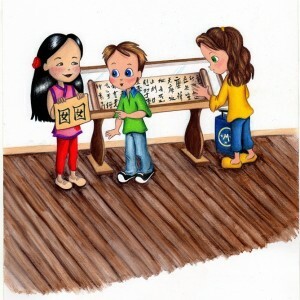 This means a Mandarin speaker would not recognize at least some words, possibly many. 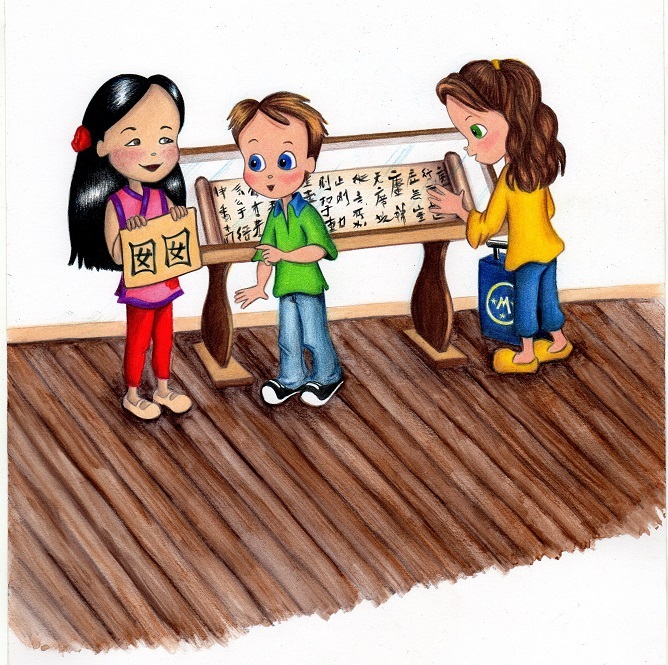 A Shanghai native could write down something the Mandarin speaker understood, but then say it aloud and be incomprehensible. Shanghai is open to the ocean via the Yangtze River. It is the longest river in Asia and third longest in the world. As such, Shanghai is not only open to the ocean, but also to the interior. It’s important to note, for geography quiz purposes, that the city is not actually located on the banks of the Yangtze, but on its last major tributary (the Huangpu) before it empties into the East China Sea. It is also roughly located in the middle of the two dominant cultures of China. We’re painting with a broad brush here, but there are, essentially, two major cultures within China, the North and the South. Some commentators say Shanghai is its own culture somewhere between and I am inclined to agree. Anyway, because of all these factors, geographical and cultural, Shanghai is at the center of things. This is also true politically as Shanghai politicians often have significant influence on national politics. These are a few of the things I learned while researching Molly Goes to Shanghai. It is a privilege to learn so much while working. It makes it fun. Thanks for reading! 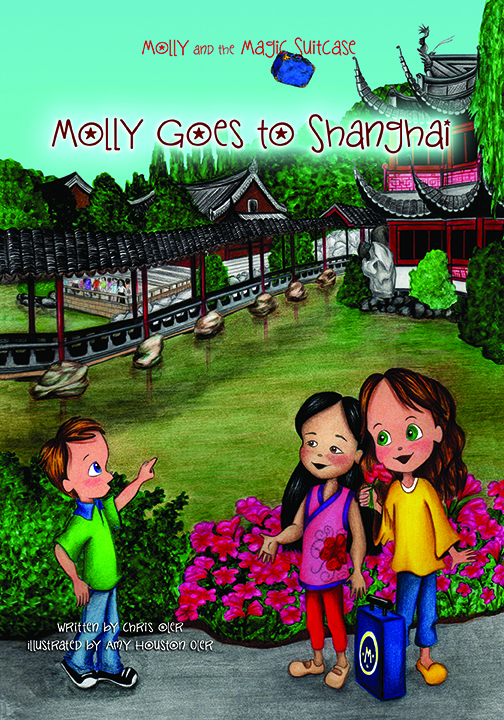 Cover for Molly Goes to Shanghai. This is Yuyuan Garden. 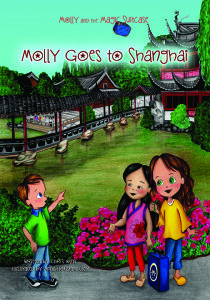 It’s a bit turned around, but this time out the Kindle edition of Molly and the Magic Suitcase: Molly Goes to Shanghai is available! This is the skyline of the Pudong area of Shanghai as seen from the Bund. We’re thrilled with this one. It took a lot of research and we had our main contributor proofread it. It’s fun and there is much to learn. The print edition will likely be available tomorrow, but we won’t make a formal announcement until Monday. We reach more people that way. Here are a few images. 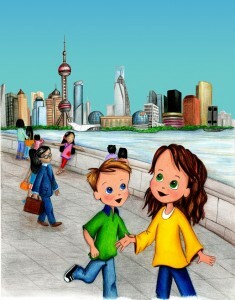 Molly wonders what awaits in Shanghai, China!